The Jingle Bells Food Drive was an overwhelming success! 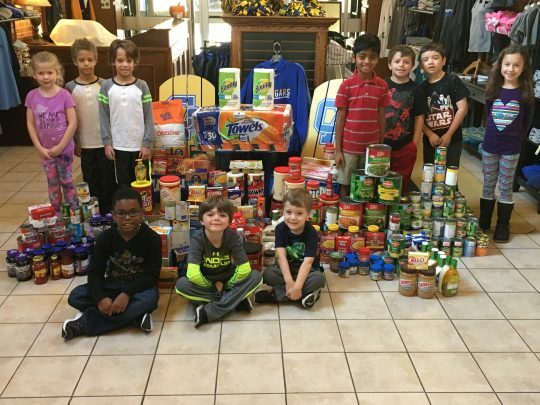 We appreciate and thank those who donated for helping to make this food drive such a successful Lower School service project. Your generous support will help those in need around our city. Donations were taken to our local Loaves and Fishes center. Today we say thank you to all our students, faculty and families at our Annual Thanksgiving Lunch. Approximately 1,000 people will be served a traditional Thanksgiving lunch in our cafeteria today. 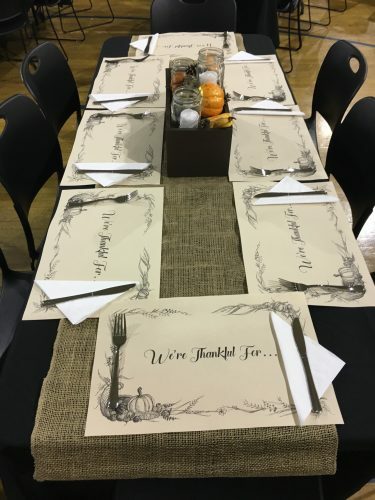 We are thankful for each student, each parent, each grandparent and sibling, for each teacher, staff member and administrator at Clarksville Academy. We wish you all a safe and happy Thanksgiving. CA will observe the Thanksgiving holiday beginning Wednesday, Nov 23 through Sunday, November 27. Classes resume Monday, Nov 28. We are pleased to announce that our After School Enrichment program will begin next week! We have two wonderful offerings—Cursive Writing with Mrs. Marla Clemments and Drawing with Pencils and Pastels with Mrs. Shelley Holt. Registration is online here.